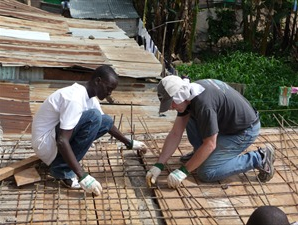 NAIROBI, Kenya (ABC 4 Utah) – The World of Difference expedition to Kenya is the trip of a lifetime for the volunteers. With only a few exceptions, they were college students. Most had not been out of the country. None had been to Africa. Half of the team worked fulltime at the school site. The other half was also assigned to Nairobi hospitals. The hospital teams were made up of second year doctoral students of physical therapy from Rocky Mountain University of Health Professions in Provo. They shadowed Kenyan physical therapists when they weren’t working construction. During the week, the team members put in long days that usually began before 7:00 a.m. with breakfast at the Amani Center, a guest facility at the monastery of St. Benedict’s Catholic Church. They packed their own lunches and were off either to the construction site or the hospitals by 9:00 a.m. Work didn’t end until around sundown. On weekends, though, they played tourist. The first weekend in the country, they went to see the animals in parks outside of Nairobi. At one park, team members got “up close” with giraffes. I mean really close. The park had an observation platform where they could look eye-to-eye with the animals and even feed them. And those brave enough, could put a food pellet between their lips and invite the giraffe to take it – and in the process the giraffe would give them a sloppy kiss with its considerable tongue. “I got kissed by giraffe!” exclaimed Melanie Yakemovic, a Rocky Mountain University student from Georgia. Of course the crocodile she and others got to hold were relatively small – 3-4 feet long. What’s more, the keepers did give them some basic instructions: 1) don’t hold it by the jaw (it can still bite) and 2) watch out for the tail. Later this week, I show you the team members on safari in the world famous Maasai Mara. A World of Difference: Africa. Brent Hunsaker brings this Good 4 Utah Experience all week long!